I originally gave this post the title “My new favorite graph” but figured that was too vague and nondescript. Most of my readers, and anyone who listens to the Jarrod Thomas Show (KNOX 1310 AM, Grand Forks), know I look at lots of graphs and lots of data. It is actually what I do to unwind. Pair that with the attention oil gets in the media (local and national) and you get my new favorite graph. 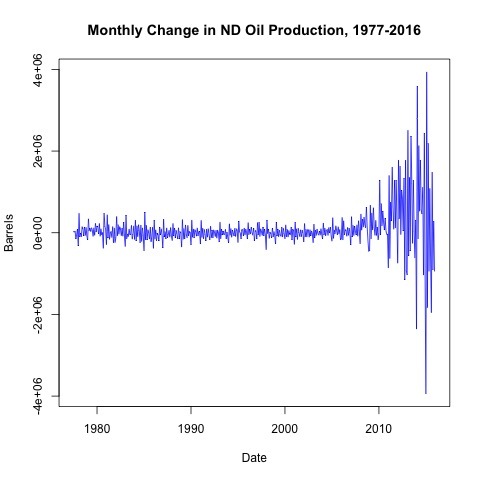 A colleague and I are looking at comparisons of the last oil boom in North Dakota (think late 1970s and very early 1980s), and the current one. I will address price changes in a later post, but right now we are going to keep it real, as in real output. In this case that is barrels of oil. I wanted to see the monthly change in oil output looked like across the long span of time encapsulating both oil booms. I think it is a pretty remarkable picture. You can see a little more volatility at the early end of the time span, which is clearly gone by the 1990s. Then there is remarkably little change in the picture until we hit 2010. Then it literally looks as if all hell broke loose in oil production. Remember, this is output, not some measure like price where we might believe there are inflation effects requiring adjustment. The conventional wisdom time and again was the West knew how to respond to this because they had seen this before. Umm. No they didn’t. When I see a picture of a Van Gogh on a cell phone background, it is in no way, shape, or form a comparison to seeing the real thing. There is simply no comparison of the changes occurring in the North Dakota oil industry in the 1980s to recent events.